AAF may Shut Down "within days"
The Alliance of American Football, the "Jr. NFL" and latest attempt to bring Football to the NFL offseason is yet again in a tough spot. It's owners, in what's believed to be a bid to pressure the NFL to concede some assistance to them are threatening to pull funding, effectively killing the new league 7 weeks in. Oof. The Alliance has to be the biggest spring football bust ever. Not even lasting the whole season? That is historically bad. The Alliance may be gone, but at least we'll have the XFL in 2020. Pretty crazy how fast it all fell apart. Going to be interesting to see what the end result is when the journalists and insiders are all done dissecting the AAF, though the general consensus as of this writing seems to be that Tom Dundon is an idiot, and therefore the league cannot continue. Probably the best-written story covering that angle that I've read on that can be found HERE. With the AAF gone, it does really put all the IFL naysayers into perspective, and really puts the heat onto the XFL next year. 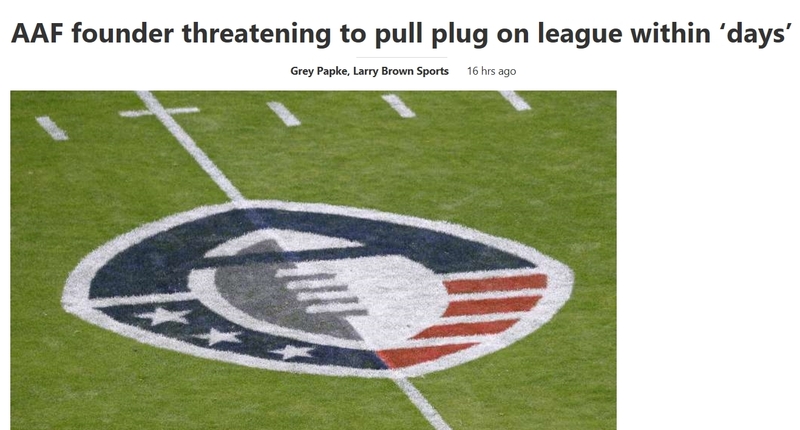 I'd expect the AAF fiasco has put some strong doubts about the viability of "alternative football" into the minds of investors, sponsors, and networks, so the XFL's got an uphill fight to viability ahead of it for sure. On the brighter side of things, I've still got plenty of IFL ball and a little more NHL hockey left to keep me busy. I know the baseball fanatics are already back in the "swing" of things, so the loss of the AAF isn't leaving any "holes" in my schedule, nor anyone else that I know around here. The Blizzard stands 3-2, and we're up against the Steamwheelers tomorrow for what should be another win. Not sure which team(s) you might be rooting for, but it's been a good season so far. Sadly, both teams I used to root for in the IFL folded, so I haven't watched much IFL ball in the past 2 seasons. I did watch the playoffs last year and they were great. Even though the Alliance is gone, I've got NHL playoff hockey (Go Stars! ), NBA playoff basketball, and the rest of March Madness. It should be a good game, we've got some killer talent, and the Stars have the power of SpongeBob. As someone who was a Stars (and Spongebob) fan before that happened, seeing that happen was insane. Although, contrary to popular belief the Stars had actually been playing Sweet Victory BEFORE the Super Bowl incident happened. Quote from spiderfan As someone who was a Stars (and Spongebob) fan before that happened, seeing that happen was insane. Although, contrary to popular belief the Stars had actually been playing Sweet Victory BEFORE the Super Bowl incident happened. That the NHL is better organized than the NFL doesn't surprise me one bit. So the Stars and Blues both won their respective Game 1 road games. How bout them apples? Well, the AAF is gone with the bankruptcy courts. Sad to see it go, but now that the curtain has been lifted on what a disaster it was behind the scenes, it makes more sense as to why they did what they did. CBS put out a huge wall of text on it HERE for anyone curious to know more. Again, this does put a LOT of pressure on the XFL to do well. The AAF's collapse can't have made anyone (let alone investors!) too keen to move ahead with "alternative" football. Quote from Maklarr4000 Well, the AAF is gone with the bankruptcy courts. Sad to see it go, but now that the curtain has been lifted on what a disaster it was behind the scenes, it makes more sense as to why they did what they did. CBS put out a huge wall of text on it HERE for anyone curious to know more. The biggest difference between the XFL and the AAF is that the XFL is going to be fully funded. Vince McMahon has sold 100s of millions of dollars of WWE stock to give the XFL the cash it needs to succeed. Honestly, I'm more worried about getting to watch the games at all. I really hope the AAF's shutdown doesn't affect the networks too much, as seeing the AAF games was tough enough. I'm sure the WWE has methods of getting the games out even if they don't fit onto "normal" TV, but I'm not sure how easily they'll be to watch if they are obscured like pay-per-view. Ah well, I suppose we'll see what they've got cooked up when it launches. Rumor has it that the XFL is going to be on ABC, FOX, FS1, and ESPN. The XFL commissioner Oliver Luck has made a big deal of the XFL getting great exposure by use of traditional TV.